A picture is worth a thousand words. Mail your favorite 4" x 6" photographs to family and friends with our exclusive collection of greeting cards mailers. It is easy! Just place a photo behind the three-fold die-cut window and close. Two full pages are available for either a personal note or additional images. Each package contains four blank cards and four colored envelopes with peel and sticks tape on each card. 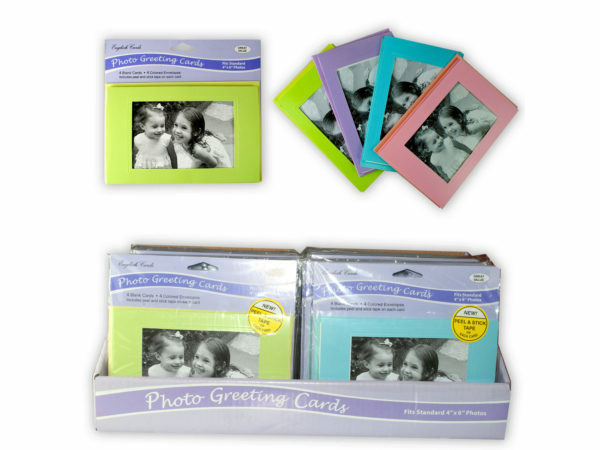 The photo greeting cards come in pink, blue, purple, and lime - it is packaged in a poly bag with a hanging panel. There is 48 set of 4 greeting cards packaged in a countertop display.